Synopsis: [From IMDB see: here] On Batman’s annual intensive patrol of the street where his parents were murdered, Roland Daggett plots to devastate it. 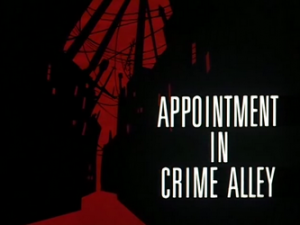 On first glance, Appointment in Crime Alley, might not appear as one of the most memorable of the series output. Without either a memorable super-villain or interesting plot dynamic (as in P.O.V, see: here), the episode does little to attract the attention of its largely younger audience. Yet what it does do well, is not only add to the character of Batman/Bruce Wayne, but Gotham City as well. Appointment in Crime Alley is largely based on the Denny O’Neill story, “There is No Hope in Crime Alley”. 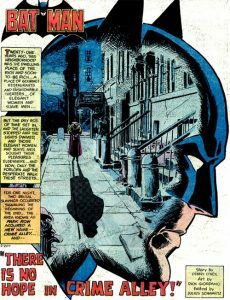 Written by Gerry Conway (co-creator of Marvel’s the Punisher), Appointment in Crime Alley largely succeeds at adding some interesting elements to the series’ incarnation of Batman. Partly based on the Denny O’Neil penned story “There is No Hope in Crime Alley” (Detective Comics #457 – 1976), the story follows Batman as he attempts his annual visit to the place where his parents were gunned down years before (now nicknamed “Crime Alley”). As he attempts his annual pilgrimage, he finds himself having to not only foil a series of crimes across the city, but also stop Roland Daggett from demolishing the entire area by making it look like an accidental gas-leak. Here, we can see not only the criminal activities that plague Gotham (all of which appear by some degree linked to Daggett’s plot to destroy Crime Alley), but also the economic and psychological deprivation to which it citizens are victim to. Whether it be gangsters attempting to illegally clear people from their homes, or a desperate man holding an employee of Daggett’s hostage, Appointment in Crime Alley illustrates Gotham City’s effect on it citizens; offering a picture of a true American hellscape. It’s a nightmare that sees the villain (Daggett) get away and abandoned buildings demolished. A place where good people are punished and the bad prosper. It’s therefore no surprise this place needs Batman to help police it. Appointment in Crime Alley marks the debut of Dr Leslie Thompkins. While Gotham is provided with further character points, the episode also marks the debut of Dr Leslie Thompkins. 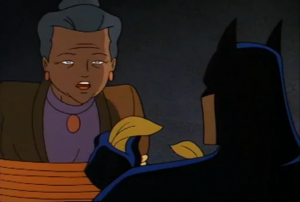 Acting as a caring, maternal figure to Batman, Thompkins has long stood as a mainstay within the character’s history. Here, she is welcomed as strong-willed but loving woman who cares for her community as well as Batman himself. As the first person to comfort the young Bruce Wayne following the death of his parents, through her, we gain a human and vulnerable side to the dark knight detective, one that has scarcely been seen before. Not only this, while Batman may demonstrate his obsession with his past trauma, particularly through his annual visits to Crime Alley, Thompkins also offers further hope to his crusade. As the episode concludes with the image of the caped crusader kneeling before the twin roses, Batman states that: “Good people still live in Crime Alley,” indicating that no matter how dark Gotham may become, he has faith that good will continue to shine through. 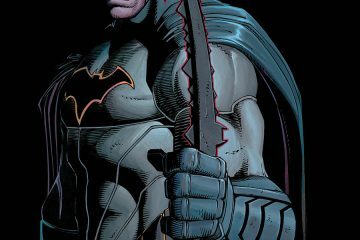 It’s a key part of Batman’s persona that sometimes gets lost within the darker interpretations of the character. 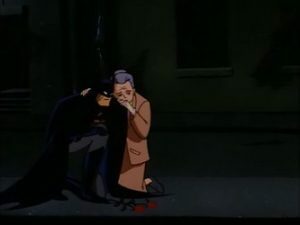 Batman mourns his parents with Leslie Thompkins at his side. While the character and dialogue work in Appointment in Crime Alley is largely strong, where it does lack is in the plot department. By following such a cliched industrial sabotage plot (set up by the aptly named “Nitro”), the episode never truly gets out of second gear, and while the action and animation is largely solid, there never quite feels as though there is a final “pay-off” at the episode’s conclusion. Despite this weakness, the episode does come complete with one of the best scores that the series has on offer. Here, Shirley Walker and her team give a rousing and powerful theme that stands above many of its contemporaries. It’s an excellent piece of work and a demonstration of Walker’s excellent skills as a composer. Overall, Appointment in Crime Alley works as a successful addition to the series’ mythic incarnation of the Dark Knight. With some excellent music, character work and writing, the episode adds to the fabric of the Batman character, whilst introducing one of the most influential characters from his comic book past. While the plotting may be weak at times, overall the episode provides an interesting insight into the world of Gotham City and Batman himself, offering hope to a city that can sometimes appear surrounded by darkness.